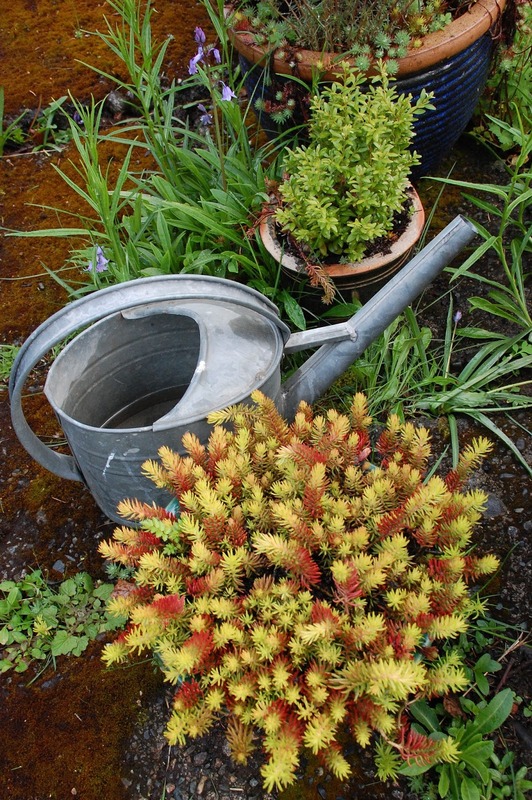 Photography gives us the power to isolate scenes from contexts and in so doing make them appear self-sufficient: above, a watering can, some plants in pots, and nature poking through and around. Instant still life composition, if you will. This ability to isolate compositions uncovers loads of subject matter in gardens, which while unified wholes comprise an array of scenic elements. Any number of them in fact, as it's rather arbitrary where one scene begins and another leaves off. But the camera's shutter resolves any ambiguity with finality, peeling off a distinct slice of reality and rendering it as self sufficient - a small world of its own. And in these digital times, compositions can simply be re-framed until a pleasing amalgam of content and angle emerges. Now why it is that one collection of objects suits the eye while another does not is a mystery, a product of aesthetics, opportunity, and our subjective intent. Also, the technical frame of the camera's lens, the rectangular boundaries that can be set horizontally or vertically and brought closer or set farther back, causes modes of viewing to appear that aren't necessarily evident in the same way to the naked eye. As a recording device, cameras create a facsimile of reality and in so doing, they create entirely new possibilities. Releasing the camera's shutter determines the take with finality, and the beauty revealed (if beauty was sought) is indeed in the eye of the beholder. I haven't reflected on where this urge to assemble things into still life compositions, or to focus on patterns or details in scenery, comes from. But I seem always to have inclined towards it myself (my godmother painted still life settings and close ups, and I was always intrigued by her work), and I still enjoy searching out what to me seems a good cluster. Good clusters almost invariably have some innocence or humbleness or even a naievete about them, although marks of wear, passage of time, and even signs of slow demise can reveal beauty in everyday objects. But I've come to realize that my eye doesn't differentiate still life from close up photography very clearly, so they tend to shade into a continuum of effects. In this post I'm sharing a few of my own takes as eye-bait and to illustrate how simple things - as often found together by chance as intentionally placed - can yield, if not outright beauty, then at least visual interest when they are focused upon and isolated. Of course, the momentary passing light they're seen in matters too, structuring the distinctiveness of the impression left - for in some sense, the collection of objects or block of patterns actually is the light the picture shows it in. Sometimes you just happen upon subject matter by chance, as when I noticed the snail above patiently crossing a deep gulf between some paving stones. 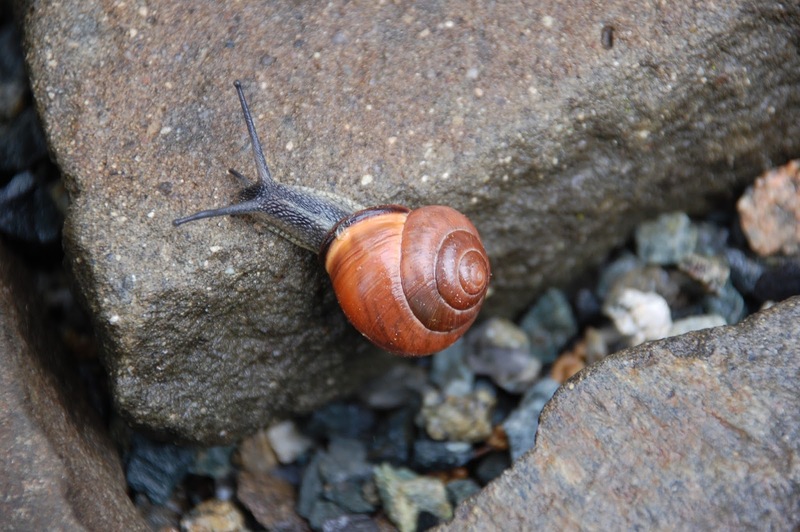 We only see these snails after a rain, while the ground is still moist and they can move about without dehydrating. This picture involves an element of chance in that it only existed for a moment: here the snail is just completing its prodigious stretch across the gap, drawing its shell back over an extended body in completion of its forward movement. Chance timing, while a great generator of pictures (this scene changed in a slow-motion moment) is one source of still lifes, but I also enjoy using certain favoured objects as props in creating my garden still lifes. I deploy these props to catch or model garden effects, as with the watering can in the opening shot in this series, or the weathered teak chairs below. 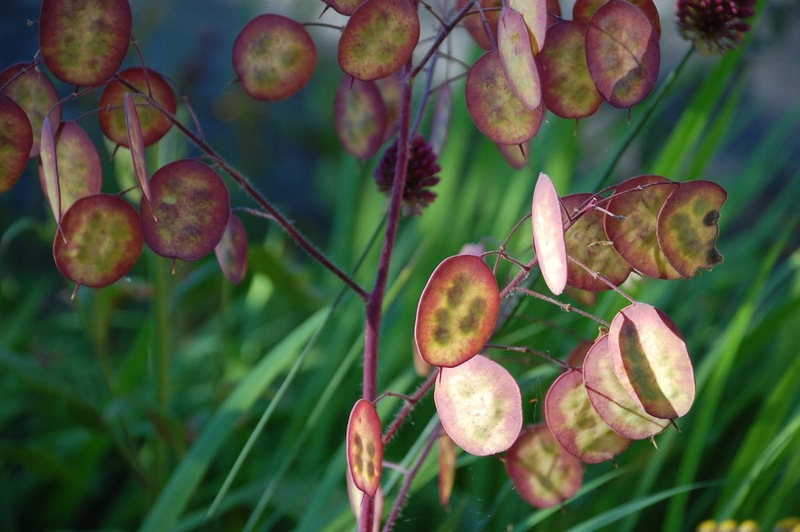 They reliably give specific impressions of light at a particular moment or display seasonal garden effects. The watering can confirms the nature of the scene portrayed, suggests human engagement with plants and implies something quite intimate about the garden itself. Back to the continuum I mentioned: the weathered chairs below could be considered more scenic than still life. 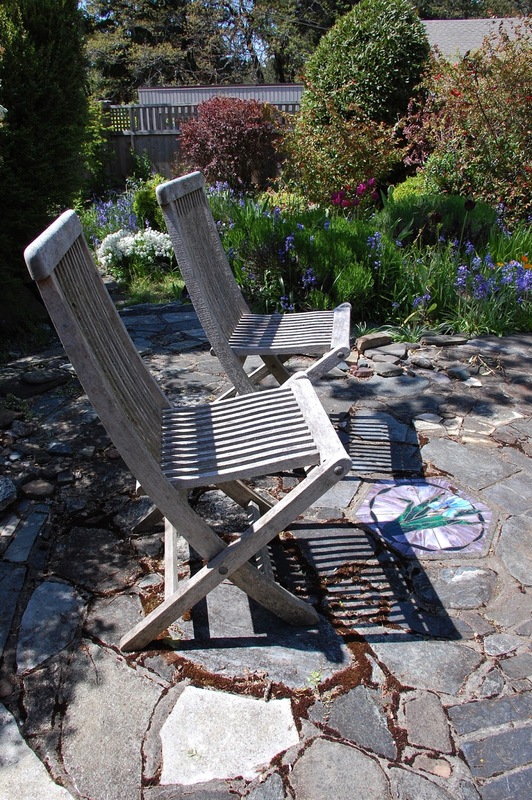 Quite apart from my reliable metal watering can and these weathered chairs, garden plants themselves furnish unlimited opportunities to frame photos as still life. 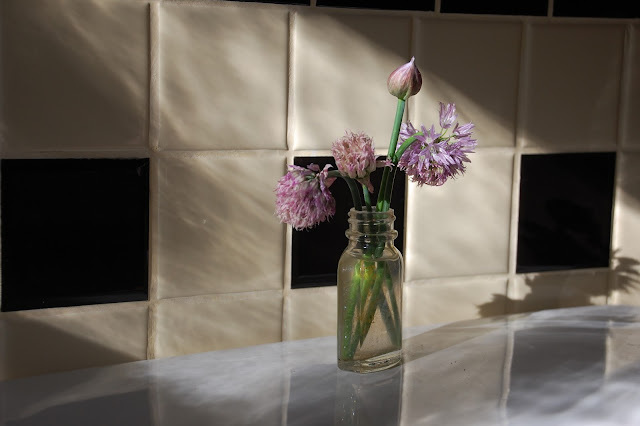 Perhaps this practice bends or stretches the notion of still life even further, but freezing objects at the moment the shutter releases does guarantee the objects are frozen in the outcome. I look for clusters of objects that combine elements of spontaneity and arrangement, so there is something of a found aspect incorporated into the picture (by found, I mean that some force other than conscious human intention is engaged in bringing off the arrangement, such as time, weather, or the chance placements selected by nature). 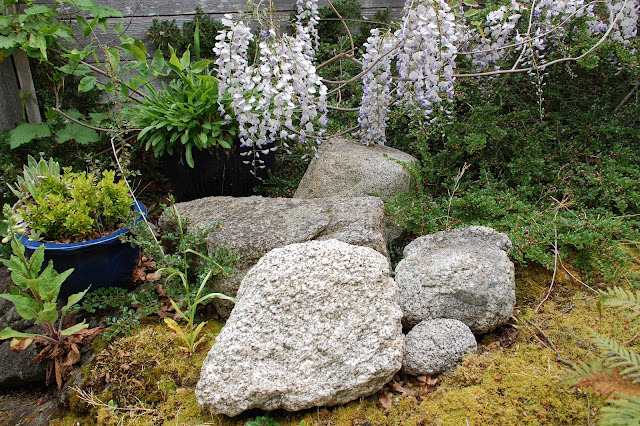 The next shot illustrates this blend of intention and discovery: the pot and rocks are of my choosing, but the blossoms are from a neighbour's wandering wisteria that has grown itself into the scene (with a little encouragement). I find this recognition game endlessly entertaining, with the added benefit of yielding pictures that capture particular moments. There is, I know, if not an artificiality, then an unreality to this, as all growing things are actually in motion and at any point fall somewhere between being born and if not outright dying, then dying back. But, so too are the fruits and flowers in a painted still life, and even the vessel containing them, frozen in the painting's singular moment, likely winds up broken at some point down the line. To me, flowers themselves are among the most intriguing garden subjects for still life or close up compositions. Individual flowerings typically result in a brief but spectacular show of bloom, after which the plant's presence recedes to context. Below is a shot of a bearded iris that isolates an intricate bloom with its fetching falls against a backdrop of indistinct green tinged with yellow, amplifying the overall impression. I like using this technique of selective focus to create a context that's more colour than form and that has a sympathetic effect by putting the principal object in sharper relief. This makes the background more effect than distinct setting. Below is another frame, taken on a different April day. 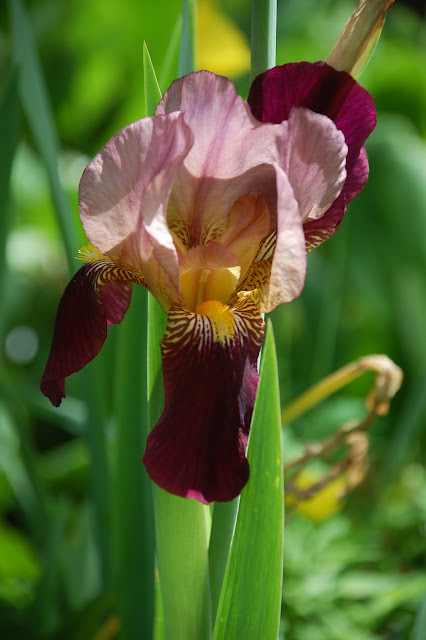 Both the iris above and the tulip below are plants inherited with this garden, some thirty years ago this spring. I've helped them to continue to flourish here by periodically dividing and replanting them in freshened soil, and they have responded by reliably adding their simple beauty to our spring's slow, captivating narrative. I've come to realize through close observation that here on southern Vancouver Island, with our temperate climate and slow, moist spring, the spring-flowering plants actually extend through early, middle, and late embodiments, a fact that can be marshalled by gardeners to prolong a sequence of effects for daffodils, tulips, quince and lilacs that extends their floral effects for a longer season. I was unaware of this potential for floral differentiation after growing up in Ontario, where spring comes all in a rush and things flower simultaneously rather than in distinct sequence. The tulip shown below is in the middle-to-late part of tulip-time on this site, helping push the season into a fifth or perhaps even a sixth week of species-flowering. This time some purplish hints in an indistinct background enhance the delicate pink of the tulip flower. To botanize a bit, we are playing around with varieties to express species-effects. Another thing I enjoy exploring in plants-as-subjects is the vast array of impressions transmitted over the course of their flowering and finishing, from first appearance to full-on flourishing and even, for some plants, so far as their beauty in running to seed. Below, an annual lunaria has set large seeds that are just discernible within translucent pods, shown while the plant is still alive, yet not that long before it expires and begins bleaching to fall grey. Lunaria, known commonly as 'honesty' in England, is also called 'money plant' in Asia, and 'silver dollars' in the USA. 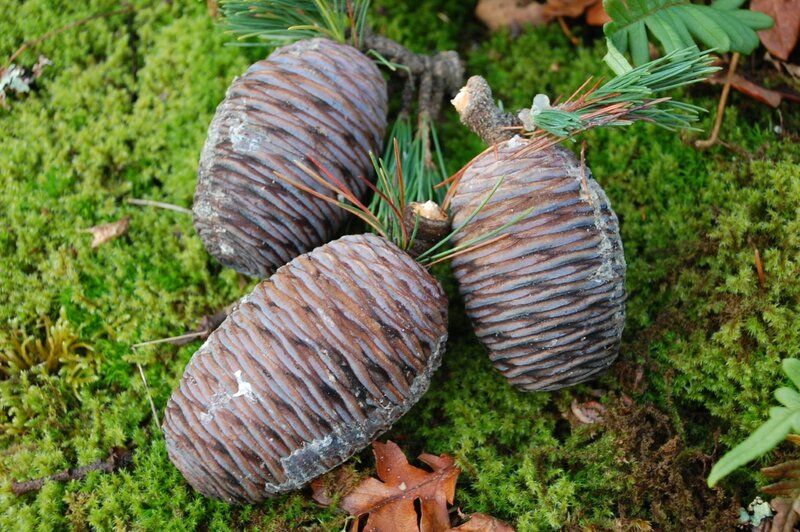 The latter two names refer to its thin, dried seed pods having a somewhat coin-like appearance. In 1884, Van Gogh painted a lovely still life of honesty's bleached pods in a vase with other floral elements surrounding it, but they are not made to resemble coins in his rendering. Camas lilies are native to our slender peninsula on Southern Vancouver Island, a key landscape signifier in spring's slow, spectacular flourish. 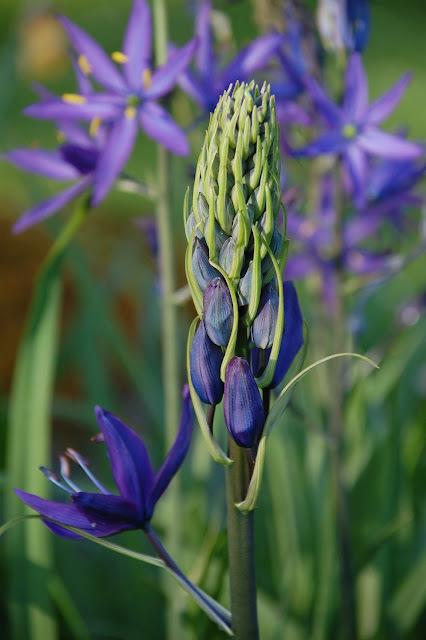 The quintessential meadow flower, camas thrust up dramatically under the native Garry oaks before leafing out, seeming to appear from nowhere (as bulbs do) sometime between late March and early April, initially strikingly blue-tinged as the blooms appear, but running towards a purple effect as the petals burst open. The shot below captures this briefly blue moment, just before the floral explosion. I am particularly fond of these dramatic local lilies, reintroduced to a garden contrived in a setting of mature oaks. Camas under oaks are a vestige of the extensive coastal prairie once maintained by controlled burning of the underbrush by the Coast Salish peoples, the original inhabitants of Victoria and its environs. Ironically, it was this luxuriant spring flowering that caused the British explorers to first describe this first-nation-groomed coastal prairie as "a perfect Eden", never troubling to understand the role of human intention (or its utilitarian purpose) that caused this 'paradisial' effect. Close up and still life both allow us to observe a cluster of objects, or a pattern made striking by angle and light, and catch them in a framed view with the camera. Each represents a distinct moment in time, frozen by the frame. I obviously enjoy this associating of objects through the lens, which is something that can be done equally well inside the house that animates the garden. 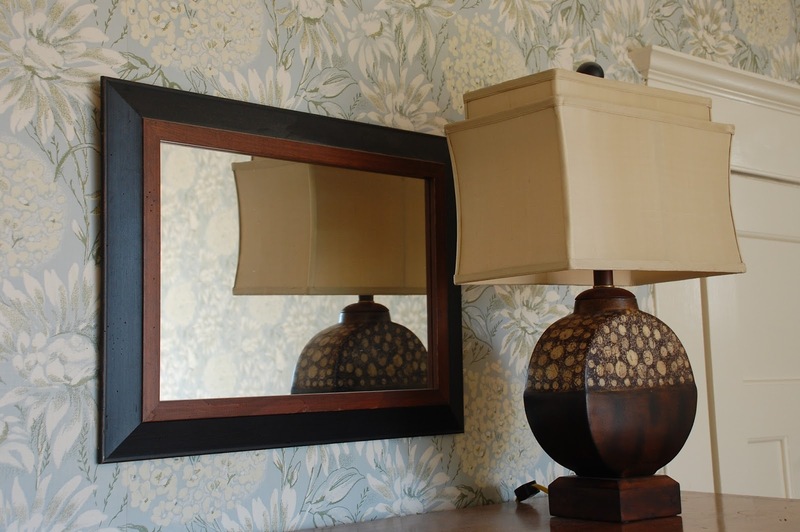 The next still life composition catches an interesting combination of shapes, patterns and tones in filtered daylight, with the added complexity of reflection in a mirror. The gentle softness of indirect exterior light gives this shot its mellow, peaceful quality. Our house-and-garden duo furnishes many opportunities to frame scenic niches, and to catch the two elements in combination in changing lights. Because this 1913 house is panelled and comes with ceilings that are beamed or otherwise spatially divided, potential compositions based on isolating clustered details abound. This capability exists in part because eyes today are fully habituated to seeing photographs of fragments of things - parts taken to stand for the wholes they've been detached from - and yet still capable of invoking mood for the absent totality. We are able to enjoy even the discontinuity effected by the mechanism of the lens and the frame of the image, because our eyes are not much affected by the arbitrariness of its closure at the edges. We literally see our subject matter photographically when we look into a picture. This house also receives a great deal of sunlight, due to its placement on a hill with many windows facing east, south and west. One effect is that the inside receives changing light throughout the course of a day, modifying the mood inside its interior spaces. This allows the framing of many views of patterns and clusters of objects, with scenic nature often glimpsed through windows as part of the scene. Light through windows is endlessly fascinating to my eye, here a stained glass window seen from within a garden shed that's backlit by daylight. This window, one of a pair acquired by chance at auction many years before the shed crystallized, had a long life prior to landing in its current position, having been part of another building elsewhere. 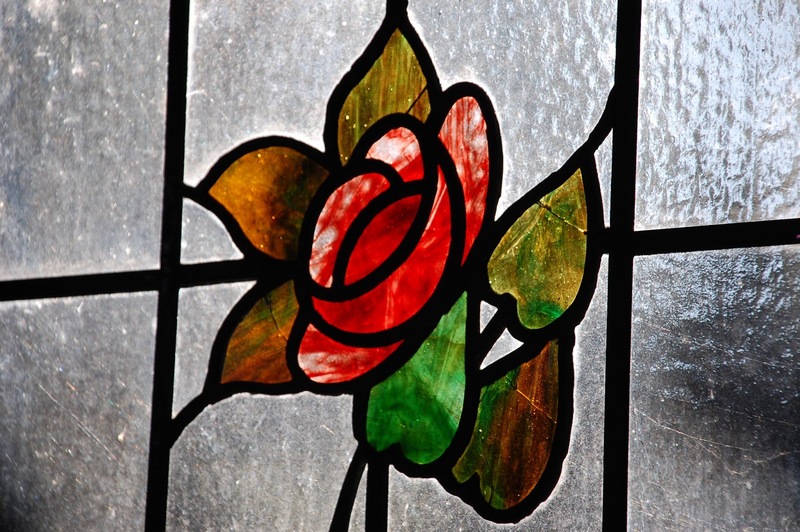 I bought these windows based on the fanciful thought that the rather art-deco flower theme would go well in a garden structure that I designed to be observed from the house. As I wasn't actively contemplating building one at that exact moment, it turned out to be a great choice when the idea actually could come to fruition. One day I was taken by the simple beauty of a some chive flowers in an old aspirin bottle viewed in fading afternoon light, against a backdrop of deco tile. The bottle was retrieved from a midden in the yard, which served as a final resting place for hard goods in the days before garbage collection in this locale, unearthed while turning over garden beds. The combination comprises a humble still life of found and grown objects, reflecting a bit of nature brought inside and placed in a piece of the inside world that was retrieved from outside by chance after having been tossed there decades prior (got that?). Many garden still lifes or close ups convey a background sense of the season they represent - flowers flower in a particular window in the unfolding garden season and imply their place and time in the sequence of bloom. Even the quality of the light itself can be seasonally revealing. 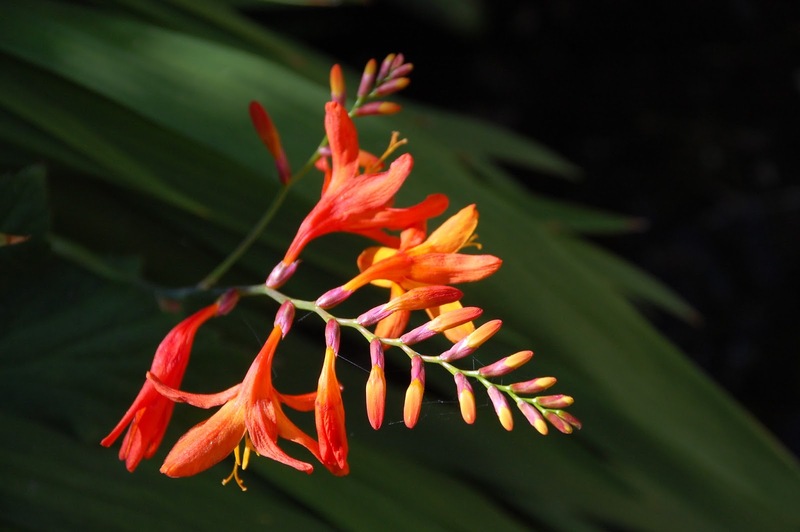 The picture above is of montbretia, which here flowers in later summer and prefigures the fall colour shift. However, seasonality can be made to play an even more explicit role in defining the overall composition. Below is an example of snow's presence truly defining a scene, in a rather sombre way here due to the dullness of the light on that day. This lack of punch in the light actually reinforces an abstract, monochrome quality, making the scene appear almost black and white (b+w photography amplifies lines of force and spatial presence in its renderings) but for a hint of mustardy yellow on the south face of the limbs and the terra cotta chimney intruding below. Just as snow reliably conveys wintry conditions, fallen leaves signify autumn's decisive impact on plants. As the production of chlorophyll comes to an end, foliage-green gives way to underlying pigments masked during the growth phase. 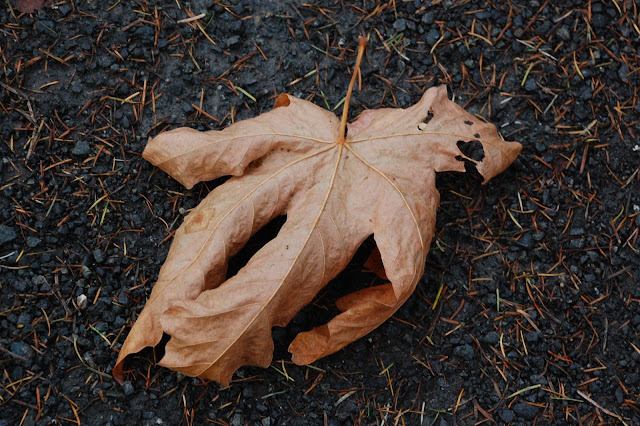 This picture to me catches the warmth of fall coloration and the sculpting of the leaf as it has dried out. Freezing rain in winter can also lend dramatic impact to the appearance of plants, giving even contextual plantings renewed potential to serve as subjects for still life. Seeing the physical world through a glazed coating is visually astounding, rendering the ordinary elements of everyday life freshly intriguing to look at. The aftermath of freezing rain makes me want to go wandering in the wonderland of special effects, seeking after visual interest and knowing that I won't be disappointed (despite heightened personal risk). 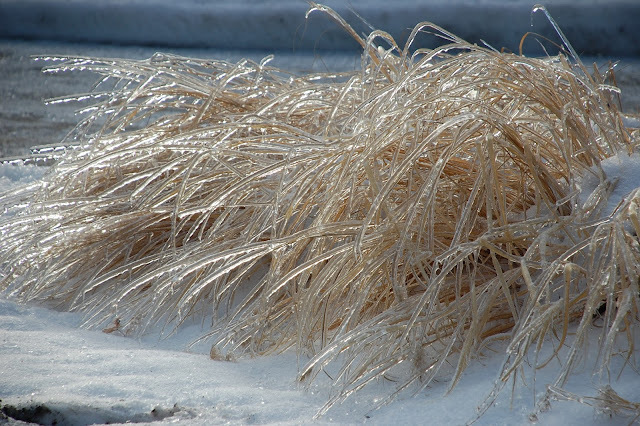 The next shot is of a clump of ornamental grass inclined under the weight of a thick coating of ice, a structure within a solid that's totally on view. 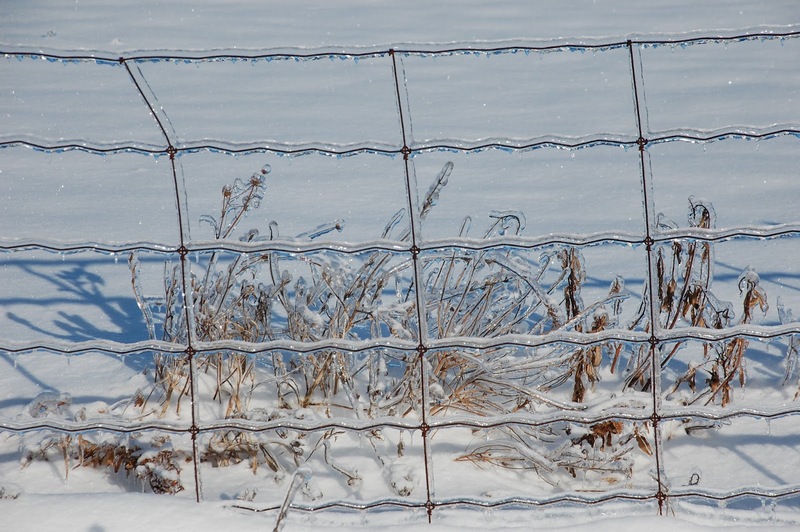 The next shot, taken after the same ice storm, shows how universal the coating of frozen rain is, here emphasized on the thin strands of wire fencing. Brilliant sunshine reflecting from the glassy coating brings the ice right up to the eye, which notices the rolling quality of the horizontal wire (traces of the spool it came from) more than it otherwise might. I like the simplicity and relative peacefulness of this composition, which takes a moment to come into clear focus. One winter day I happened to be working in the back garden, collecting the debris shaken loose from trees during the latest winter windstorm. 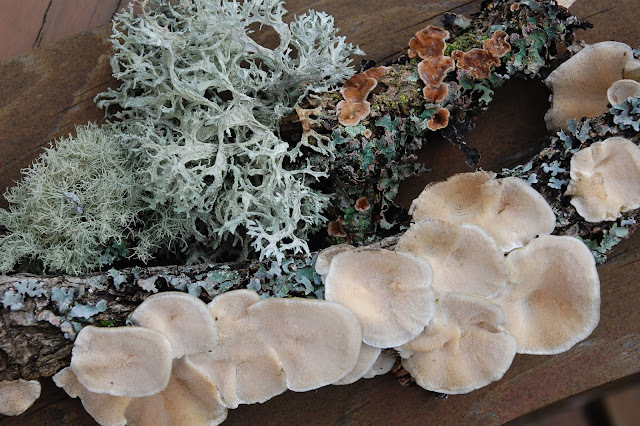 I was taken by the array of bits and pieces of lichen, mosses and funghi littered across the lawn, sometimes appearing on a single chunk of oak branch, and invoking the unique colour palette of these wet-season plants. So I pulled an assortment of random bits together on a garden bench, and from that derived the following shot as a creative clustering of this aerial debris. The picture frame 'notices' it by concentrating them into a group, something our eye wouldn't make appear in quite the same way without the isloation. I enjoy its shapes and colours immensely - the aquas especially. Many garden plants interact uniquely with their environment to create special effects. 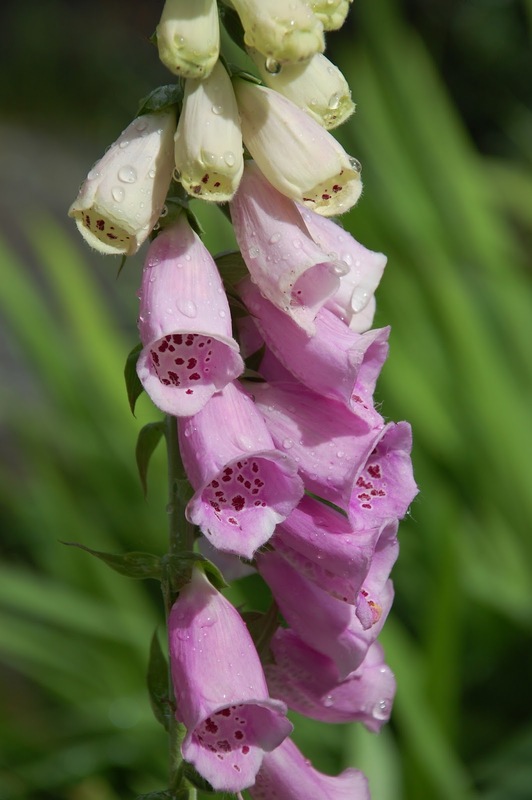 For example, seasoned gardeners often notice the particular way that rain pools on a foxglove's tubular flowers, forming distinct droplets as gravity gradually draws the moisture down to ground. Something about the flower seems almost to repel the water, forcing it to collect as droplets. You can almost feel it moving downwards despite being frozen into a still picture. These effects are transient, so if you're to catch them you need to keep your camera ready to hand. I like to garden that way myself, with the camera nearby. That way, if something suggests itself to the eye, or the light suddenly turns transcendent, the means of recording the passing effects are ready to hand. As often as not, that will simply become a still life composition. Or, is it just a close up? Or maybe a detail? My point is simply that even the humblest of gardens, say an assortment of pots on a deck or a terrace, offers the opportunity to render plants into such still life compositions. Van Gogh did it memorably with a cluster of picked flowers in a vase, a painting now famous that remained obscure in his lifetime (as did virtually everything he painted), but must have given him intense satisfaction. Look around and you'll see these opportunities lying everywhere. Go ahead and compose. It's a way to preserve a fragment of the flow of time alive for future contemplation. And it's good fun.